An established pub chain has banned its punters from using mobile phones and iPads across its 300 outlets in a bid to protect 'social conversations'. Pub chain Samuel Smith, owned by 73-year-old Humphrey Smith, has enforced the rule across its establishments and insisted that pub-goers will have to leave its premises to take a call. 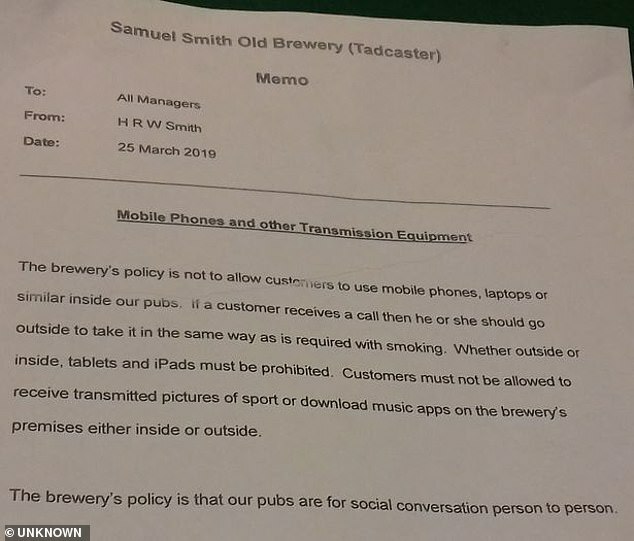 In a memo sent out to his managers, Mr Smith described how the 'brewery's policy is not to allow customers mobile phones, laptops or similar inside out pubs'. The notoriously secretive owner of the brewery is also reported to turn up incognito to check up on staff and has long forbidden jukeboxes, slot machines and even televisions at his many establishments. The new rule comes after wide speculation that an imposed ban was heading in the direction of punters. Earlier this month a ban on digital devices already appeared to be in place at the New Inn in Stamford Bridge, North Yorkshire. The digital ban also comes a year after the pub's owner imposed a ban on swearing across its pub chains. However Mr Smith is not the first person to stop pub-goers from using their phones. In 2009 the landlord of the Court Inn in Durham was seen tackling antisocial behavior by banning punters from using their mobile phones.